Ó chlé : Sheila Healy a thug an Léacht ar Naomh Pádraigh; Stephen Daunt (Scoil Ashton) ; An tUrramach Elaine Murray (Reachtaire ) ; An tUrramach Hazel Minnion ; An Canónach George Salter; An tUrramach Tony Murphy agus an Canónach Daniel Nuzum. 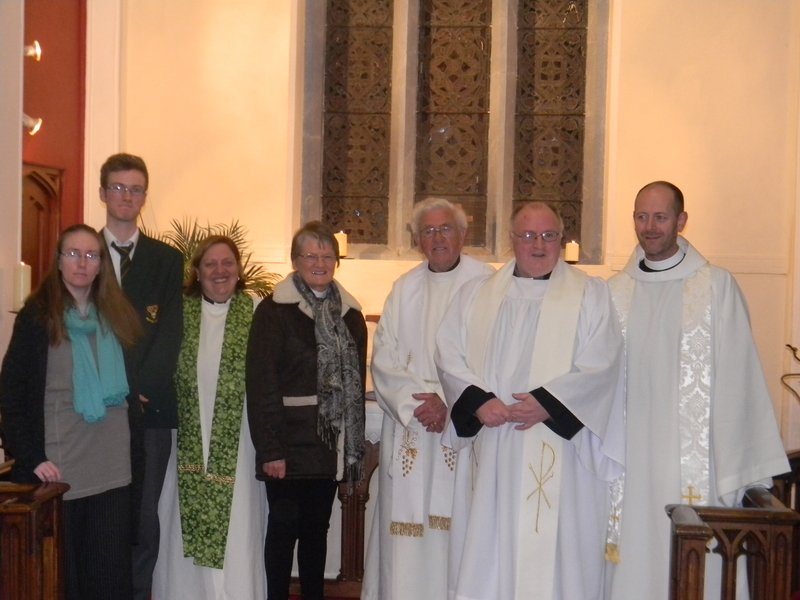 From Left: Sheila Healy who delivered the address; Stephen Daunt (Ashton School) ; the Rev Elaine Murray, Rector; the Rev Hazel Minnion; Canon George Salters ; the Rev Tony Murphy and Canon Daniel Nuzum. This entry was posted in Church Services, Diocese, Ireland, Irish Language, Saint Patrick's Day, Saints Days. Bookmark the permalink.